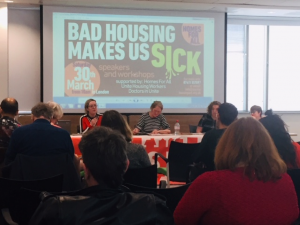 We attended a recent conference in London exploring how housing effects our health, and how we can come together to fix the broken system. Our practitioner Sandra Axell reports back. 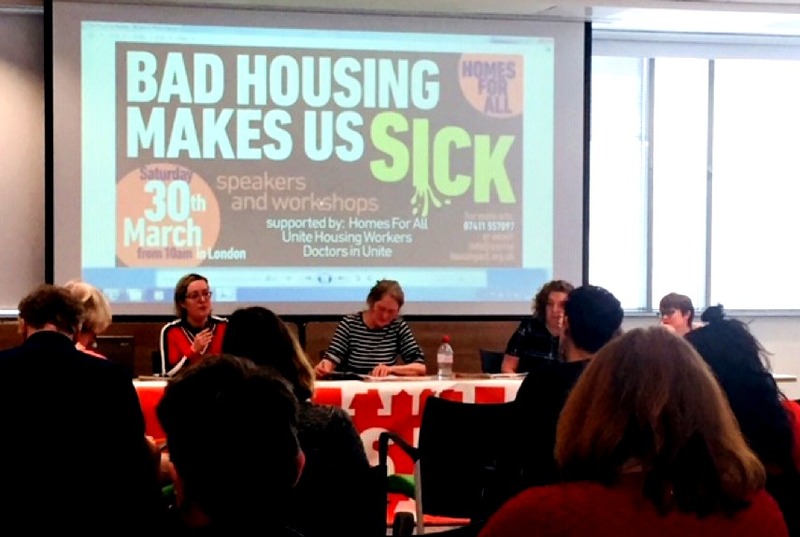 ‘Bad housing makes us sick’ was a housing conference put together by Homes for All, Doctors Unite and Unite Housing Workers in London last Saturday. 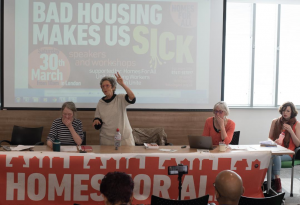 More than 100 people, including housing campaigners, doctors and health workers, trade union members and tenant representatives came together to share ideas and inspire new action plans. The brilliant guest speakers gave us all food for thought and below we share a summary of the topics that were discussed. as a human right to being viewed as a commodity that is financially motivated. In the 1980’s both Thatcher in the UK and Regan in the US introduced schemes to sell off houses in public ownership; in the UK the ‘Right to Buy’ scheme gave council tenants an opportunity to buy their home, but as more and more housing has gone into private hands new social housing has not been built, leading to many countries having a rental market that has become a ‘finance playground’. Watch Raquel Rolnik’s speech here. Journalist Dawn Foster, who writes for the Guardian newspaper among others, highlighted that the Conservative Government’s recent ‘Help to Buy’ scheme, which was also put in place to encourage more home ownership, has been hijacked by large house building companies have used government subsidies to pay out big bonuses rather than lowering the house prices. Research show that the market prices was pushed up with as much as the government discount paid out, meaning that essentially, rather than make house prices more affordable, the cost has remained the same for the buyer and the profit has gone to the house builders. In addition, the gap between rent and wages are growing. According to Shelter, between 2011 and 2017 the average rent increased by 16% nationally while wages only increased by 10%. But there are exceptions where the divide is much larger. In Barking and Dagenham, the wages in the same period only went up by 2%, but rents increased by 40%. The new benefits cap of £20,000 a year means that 97% of 2-bedroom properties on the privately rented market are unaffordable. The panelists agreed that it is time to begin viewing housing as a human right again, and that to provide stable and secure housing for families, we should be focused on building more social housing and introducing rent controls. This is not only the ethical approach, but an affordable one: When the government invests in building social housing for everyone, in about 5-10 years the dwelling has paid for itself and the tenants rent payments go back into the accounts of local authorities, instead of to private landlords. Meanwhile, rent controls and longer tenancies within the private sector offers security to both landlords and renters, and prevents bigger landlords using the market as an investment and pushing up prices. This supports smaller landlords who have homes to rent and need the security of long term rent payments and tenancies. Dr Jackie Applebee from Doctors Unite spoke about how bad housing is affecting health. Studies have suggested that homelessness can reduce life expectancy by 30 years and poor accommodation and living in poverty has a severe impact on life expectancy as well. People in temporary housing and social housing are often living in overcrowded conditions due to shortage of suitable properties. The lack of social housing or affordable housing means that people have to move more often, sometimes several times a year. Every time a household is relocated, they lose contact with their community and the support network that is available to them. Therefore, moving from a property affects social relationships and has a negative impact on mental health. Terminus in Harlow is one example of how overcrowding affects mental and physical health. The 14 stories 1960’s office block has been turned into housing without needing planning permission. The very small rooms are filled with families and single residents from councils in and around London and they are often may miles away from places and people that they know. Crime has risen in the area with around 40% since the tower block was converted and families are scared to let their children out of the room. Therefore, there is no place for the children to play or do homework, and the adults have got no privacy. Jackie, who works as a GP in Whitechapel, has seen the impact that overcrowding has on health. She says that sharing a small space is likely to lead to infections as conditions spread easily, leaving people are more prone to illnesses. Next, Hannah Slater from Generation Rent spoke about how the insecurity of the private rented market is another factor that can affect mental health. The private rented market is growing due to a shortage of council houses, along with a steep rise in houses prices that are forcing more people to rent. The Royal London suggests that half the children born in the UK are starting their lives in rented accommodation. Most tenancy contracts are ‘Assorted Shorthold Leases’ with only a 6 month agreement. And under Section 21 rules, the landlords can evict the tenant after the agreement has ended without providing a reason. This leads to families having to relocate, losing the community that they have created, as well as their relationship with healthcare professionals and services around them. Biomarkers used in a study have indicated that people living in rented accommodation have higher level of stress chemicals in their blood compared to home owners. Figures show that a third of private rented properties fail basic health and safety checks due to problems with, for example, damp and mould. But Section 21 means that tenants do not have any security, and they avoid making any complaints about the property as they face being evicted if they do. Due to the increasing number of private renters, political parties have started to take notice of housing campaigns as private renters now represent a large part of their constituency. The Mayor of London has promised to abolish Section 21, and the Labour Party has added it to their manifesto after pressure from campaigners. Another suggestion to increase the security for private renters is to have a national register of landlords and for Councils to have more control of licensing schemes that they apply for. Ensuring housing rights are enacted and reinforced, backed by a strengthened independent tenant organisation. Advocating for grant funding for existing and new council housing. 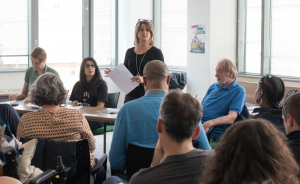 Campaigning around connected issues such as Universal Credit, bringing empty properties into use, reducing temporary accommodation, the sale of public land and investment in the NHS. Backing the Charter for Housing Action in 2019 and extend the alliance for action.